I read this book like a novel. An exchange of letters between two personalities crucial to the Italian culture of the twentieth century. On the one hand Massimo Mila, historian and musicologist among the most popular at home and abroad. On the other side of this printed conversation there is Luigi Nono, composer of Venetian origins, so loved aboad as mistreated in Italy, just as Massimo Mila wrote. Between the two, connected by a sincere friendship, there was in the course of their lives an intense epistolary relationship, through which probe the various aspects of the political and cultural situation in post-war, with a particular focus on the one thing that both felt to be the ultimate need of each other’s lives: the music. It is clear that this epistolary relationship that covers almost forty years, from 1952 to 1988, imposes itself as a valuable document useful not only to reconstruct and investigate certain facts but also to learn about and to dwell on thoughts that the composer Luigi Nono played on many issues such as the relationship with the Italian culture of the time, music research, the relationship with the protagonists of the new music, the interest in new technologies, and so on. In this long journey there are moments that relate to the experience of Nono in the field of electronic music , from his early experiences in the study of phonology in Milan until transfer to the study of Freiburg, before turning to the use of digital technology in the early eighties. It should be noted that for the realization Prometeo, Nono worked with the computer technology of the Center for Computational Sonology in Padua, Italy. An exciting and different book, able to make you feel part of the great cultural interest as well as Italy and the whole of Europe after the dark years of World War II. 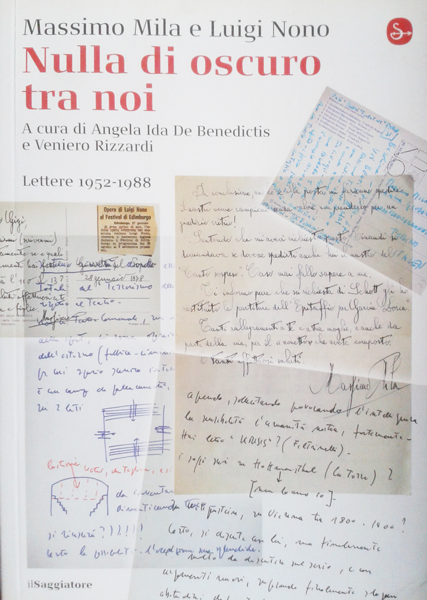 The book opens with an exchange of letters with Massimo Mila, then there is a sort of interlude fact that Nono wrote some letters and exchanged with the publisher Einaudi and then close the text written by some critics who wrote on Massimo Mila ‘work of the Venetian composer. An exciting and different book, able to make you feel part of the great cultural ferment which interest Italy and the whole of Europe after the dark years of World War II. The book opens with an exchange of letters with Massimo Mila, then there is a sort of interlude between Nono and the italian publisher Giulio Einaudi and then the book is closed by some critics who wrote Massimo Mila on works of the Venetian composer. From reading these letters, as regards Luigi Nono, the figure of a man who was all his life engaged to conduct a cultural battle, ideological and political. Then emerges the figure of the composer, not at all separated from the first, but not exclusive, as certainly magnificent for the music scene in the second half of the twentieth century.